Who doesn't love eating out? It's always great fun to head into town with friends, eat some delicious grub, and have someone else cook your dinner whilst you indulge in some yummy cocktails, am I right?! So, when my best friend Georgina and I were invited to the Coast to Coast VIP* event last week, we were over the moon (free food? Hells yeah!). Coast to Coast is an American style restaurant chain, specialising in great American dishes: premium burgers, deep-dish Chicago town pizzas, juicy spare ribs and much, much more! 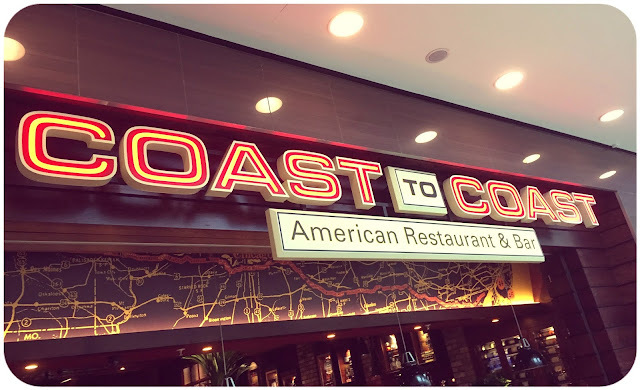 The restaurant have recently opened their first joint in Aberdeen, literally bringing a taste of the States to Scotland. As soon as we arrived, we were presented with a glass of Prosecco, quickly followed by a large mint mojito - we were off to a great start! 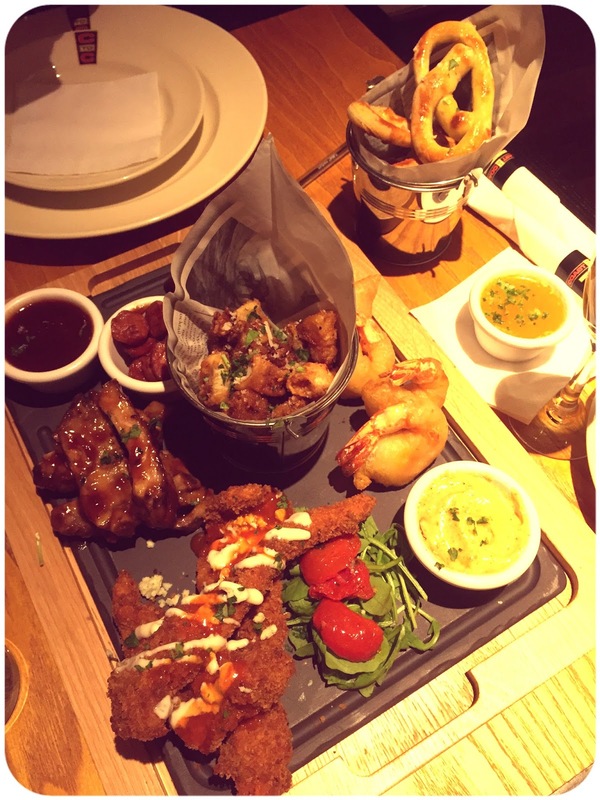 We were instantly presented with the BBQ Board for starters and munched our way through the platter. It's not something we would have normally chosen ourselves, but it was still interesting to try all the different bits and pieces (note to self: BBQ sauce, messy fingers and a white dress is a bad combo). After the BBQ feast, I decided to tackle a plate of chilli beef nachos. I'd heard it was a challenge, but I was ready for it. Well, wow. What a fool I was to even think I could attempt the mountain of tortilla chips that lay before me. Seriously, this plate was HUGE. Ginormous. Now, I know some people love huge portions, and it's always better to have too much food than too little, but this was mental (please note: the picture does it no justice!) My dish could easily have fed four people, so I felt awful when I only managed a measly quarter of the portion - very poor show from me. Georgina, on the other hand, chose a classic cheeseburger with sweet potato fries which looked and tasted delicious! After washing down our main meals with a big glass of wine, it was time to face the final hurdle; dessert. 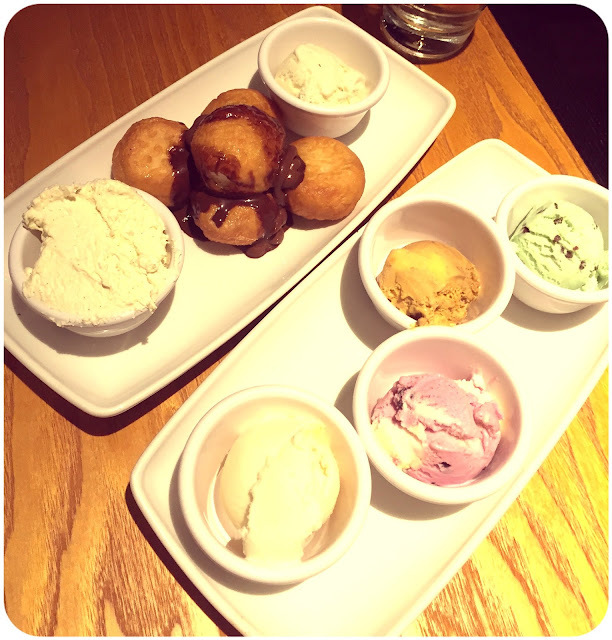 I chose an easy option of ice-cream and enjoyed a mix of four different flavours. Georgina chose sugar donuts sprinkled with hot chocolate sauce and cream. One word: yummmm. The food looks absolutely amazing!!!!!!!!!! Oh my god! The food looks so so good! I love everything! I'm starving now! that ice cream look nice! They look so yummy! Thanks for sharing!! This looks deeelish! I'm a sucker for desserts and those looks divine! PS: You now have a new follower, just found your blog and I love it! Wow, the food looks delicious, haven't eaten things like that in ages! That was so nice of them to sponsor this post! They did a great job with presentation - looks like something I could get at a nice restaurant here in the states! They really hit all the big types of food. The BBQ looks great! Sorry to hear about the lack of gluten-free options. Those are hard to find here, too. Omgosh, this food looks AMAZING. American food is the best! I love huge portions! That food looks amazing! ;) Thanks for sharing Helen! the food looks delicious! i'm glad you had a wonderful time! Great pictures, the food look yummy! Too bad the gluten free menu disappointed you.. Very delicious food and beautiful pics! The food looks mouth wateringly delicious. I am so hungry because of this post, everything looks delicious! Interesting event! Food looks amazing! Yummm, those pretzels looks amazing. Eeee dying to go here, I also live in Aberdeen! Wow this looks amazing!! 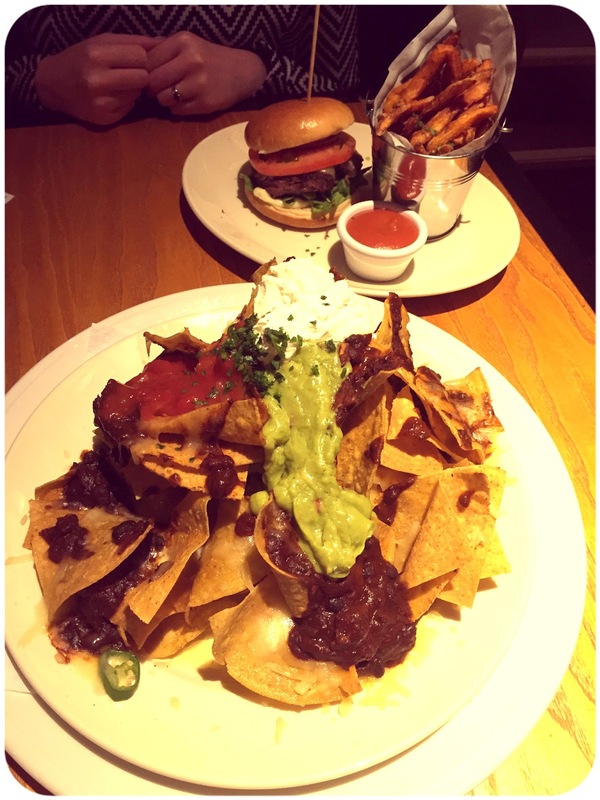 Those nachos definitely look like a challenge!